One can’t imagine a site which wouldn’t provide an opportunity to submit a message. Various response forms, message or feedback forms and other tools allowing keep in touch with your clients are extremely important nowadays. Build any of these yourself without any coding skills needed! BONUS: Create your Contact Form right here! 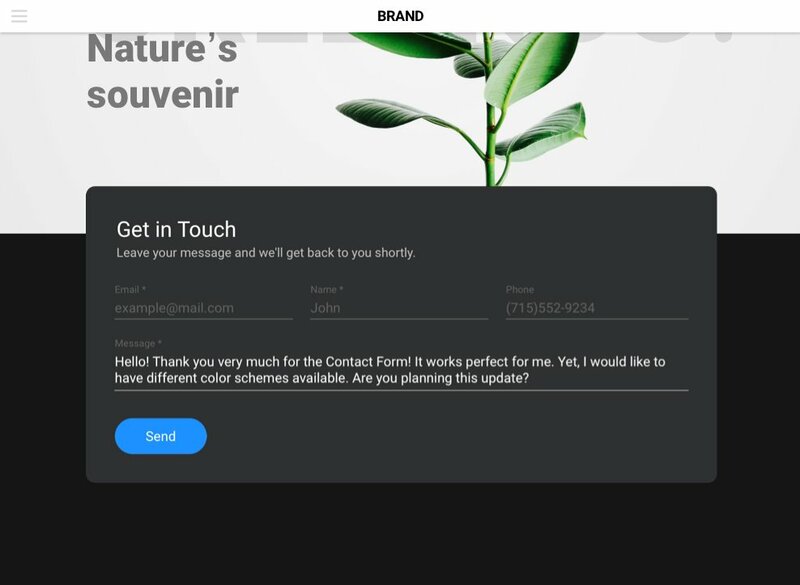 If you need a simple and effective form to receive more responses from your visitors and double your page conversion, then Elfsight plugin is the ultimate solution for you. Learn more about the plugin. Keep in touch with your customers 24/7, receiving their messages on requested email and increase leads for your business! Setting up our plugin is ultimately simple and intuitive; it will take you not more than two minutes. 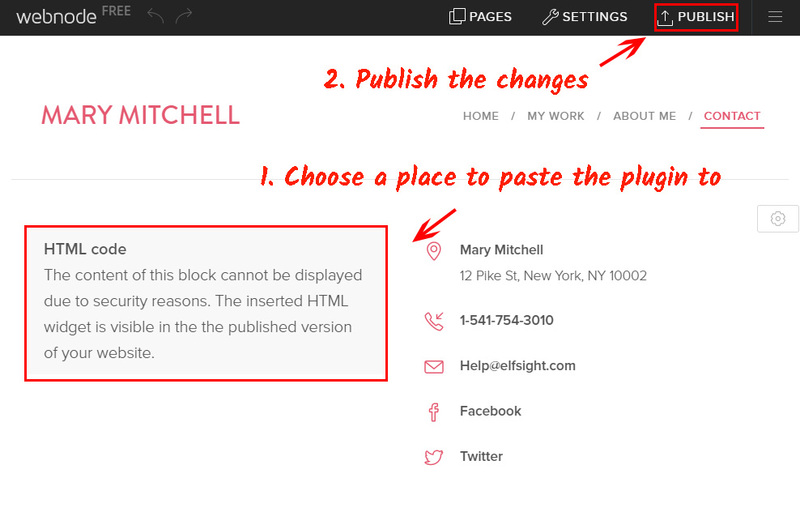 Follow all steps described below to create your plugin. 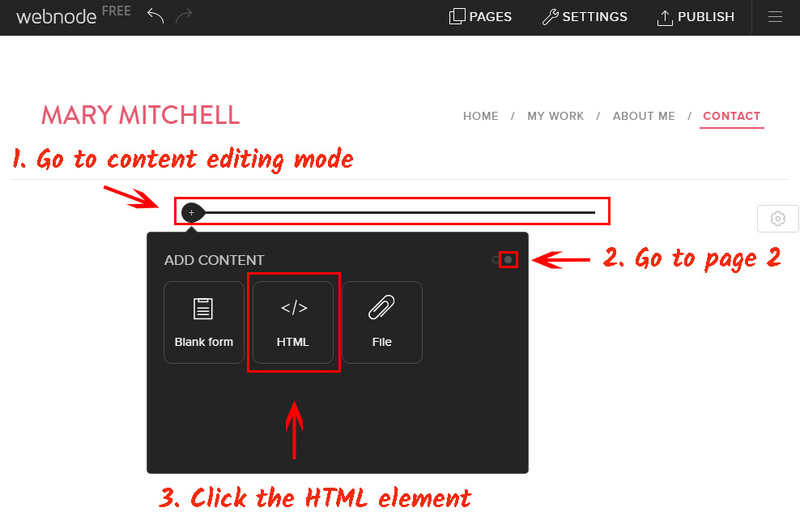 Follow this link (Live Editor) to create an widget. 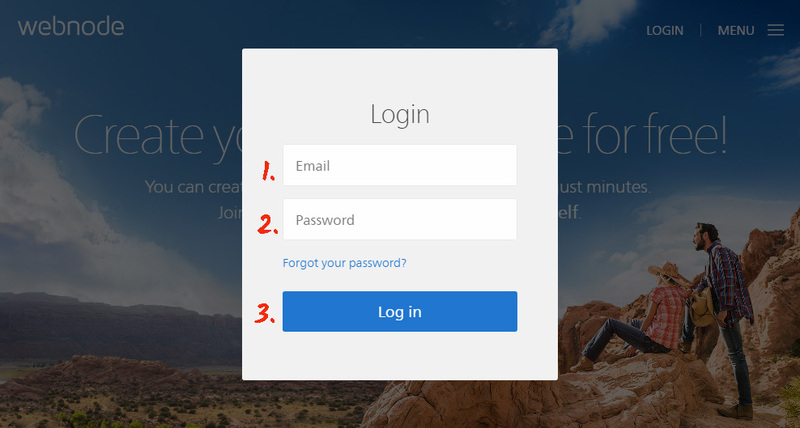 Select the design and output settings to shape the widget that will blend with your website. Or find out more on main page. 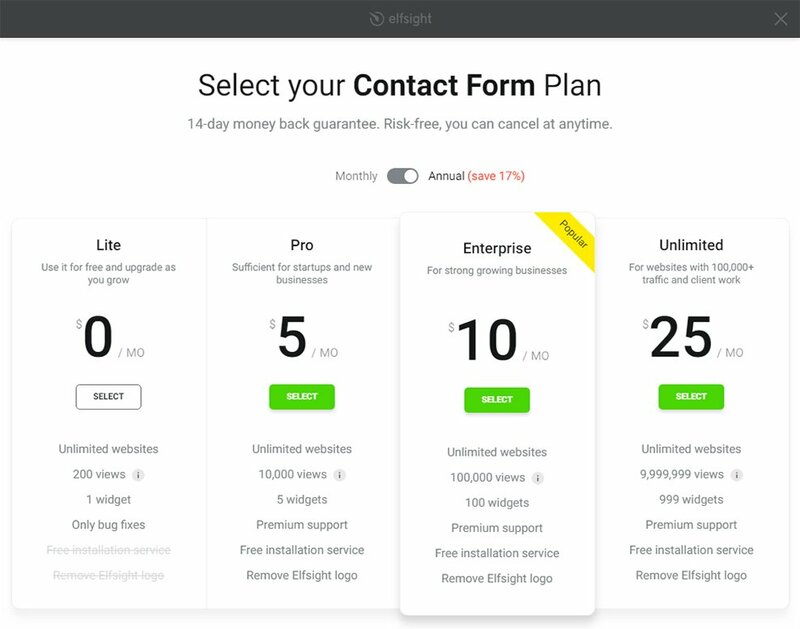 After your widget is created, choose your subscription plan. We offer free and paid plans to meet any needs. 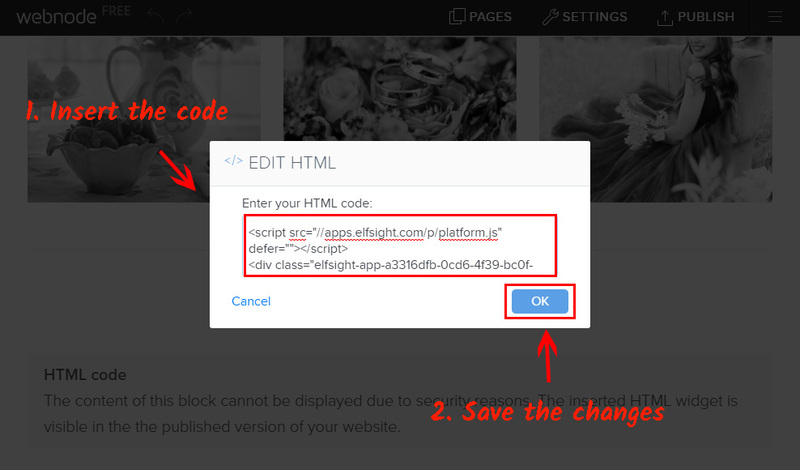 The finishing stage in installation of our widget is to get the widget shortcode. Log in to Webnode following the link , and enter site control panel. If you have several websites, choose the one, which will display the widget. Press «Edit site» to start editing. Shift to the page, where you wish to place the widget. Start editing by clicking elements icon. In the appeared window, go to the second page and click «HTML» icon. Add widget code to the appeared window and save the changes. Drag the element to the required place and apply necessary changes. Contact form has been installed! Visit your website to check your work. 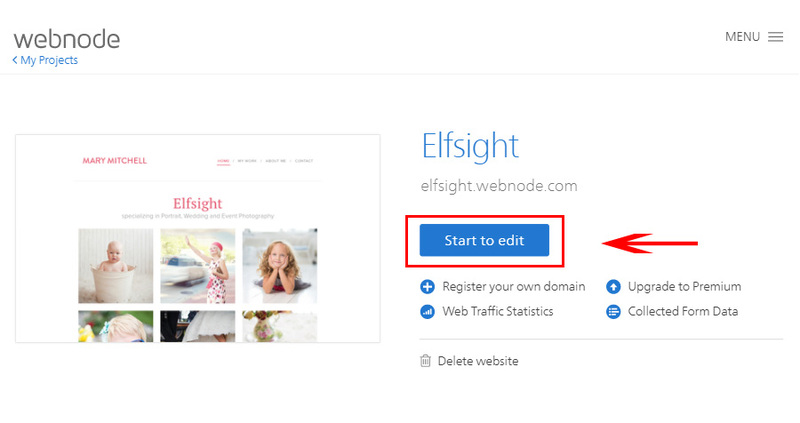 Following the installation of the plugin, it’s necessary to do all the editing of the form on Elfsight Apps website. Altering texts, changing design or mode of showing and all other updates, fulfilled in the editor, will be automatically displayed on the site. More to that, in your Elfsight profile you have a chance to see other Webnode plugins and display them on your page free of charge. 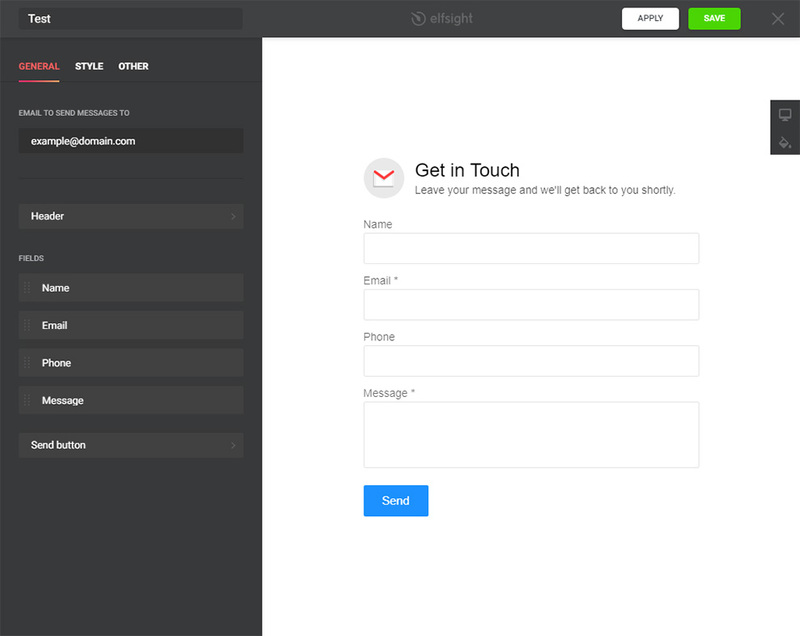 Create your Contact Form right here! Free editor for creating of widgets in a few steps.